Den Of Thieves follows a hallowed Hollywood tradition. A tradition of internal plagiarism that has stood for years on end and will stay on for years to come. We'll give you a few examples. The Fast And The Furious is Point Break with cars. Speed is Die Hard on a bus and The Matrix sequels are Dark City fused with Ghost In The Shell with an insufferable amount of philosophical jargon thrown in for good measure. In that vein, Den Of Thieves is 1995's Heat without Pacino, DeNiro and Moby's New Dawn Fades. To all those who remember Heat, this movie might feel like a pale imitation of that pulse-pounding seminal action film. To the ones who haven't, here's the plot. 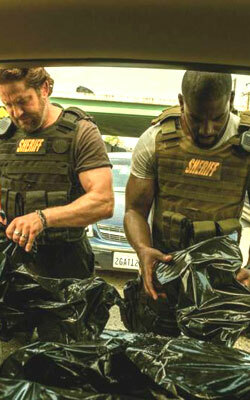 Nick "Big Nick" O'Brien (Gerard Butler) is a damaged, gritty and corrupt LA Sheriff. He comes packaged with a group of men who are equally gritty and damaged. These men are faced with their toughest test as cops when they are tipped off to the ongoing activities of Ray Merrimen (Pablo Schreiber) and his crew. Merrimen's crew devise an endlessly detailed plan to rob the Los Angeles branch of the United States Federal Reserve. As you may have guessed, Big Nick and his crew endeavor to stay a step ahead of their criminal counterparts, catch them in the act and ultimately bring them to their brand of justice. A simple cops-and-robbers story, high school playground levels of imagination, a rip-off of Heat, Gerard Butler's over two-hour struggle to keep an American accent... this movie can be described in so many ways. For the purposes of this review, we shall bring the third description into the fold. Being "inspired" by a seminal action classic comes with its own set of issues. For one, the new movie does not improve on its older counterpart's flaws, and to add insult to injury, the former lends itself to being compared to the latter at every turn. Hence, the follies become more easily noticeable. So the lack of character development afforded to the secondary characters on the police force, the lack of air-tight heist planning, the ham-fisted method with which Big Nick's personal struggles are handled and the movie's runtime work feverishly toward grinding its momentum to a halt. The secondary actors, too, seem to be going through the motions, which makes them more expendable than valuable to the movie on a whole. On the flip side, the movie doubles down on many of its predecessor's moviemaking traits. The action sequences are expertly choreographed, the band of bad guys are extremely likable, and when you watch tense heists take place in real time, you do not question the logic behind them. The final hour is slick, well-directed and endlessly engaging. However, director Christian Gudegast makes his audiences sit through an hour and change of poorly rendered family drama to get there. With that being said, kudos to the film for eliminating those hackneyed rooftop scenes with DeNiro and Amy Breneman from its repertoire. An important reason that Den Of Thieves' flaws stick out to a near unmistakable degree is its lack of a charismatic showman leading the line and masking its deficiencies. The movie does not have a coked-up Al Pacino, a cool, calm and collected DeNiro, an unhinged Val Kilmer or even a teenaged Natalie Portman. It comes with a Gerard Butler who toggles between trying to hold an accent and trying to make his performance convincing but never both at the same time. The crew of bad guys, while pleasant, are nothing more than a walking band of stereotypes. You as a viewer might see them as the military guy, the Samoan guy, that guy who is Ice Cube's son that played Ice Cube in Straight Outta Compton and 50 Cent before you see them as three-dimensional characters. Ace composer Cliff Martinez, too, seems to be working towards the forgettable. The score does have his unique musicality flowing through it at a few stages, but the whole is not better than the sum of its parts. The score, like the movie itself, follows time-tested traditions and chooses, in a sense, not to rock the boat. The cinematography, though, is a class apart when compared to most modern shaky-cam-powered action movies. The stunt choreography and action sequences come with an innate sense of spatial awareness. The movie methodically and meticulously stages its gun battles so that the audiences are fully aware of the consequences of every bullet being fired. The only downside to this exquisite visual mastery is the movie's insistence on having the '90s-inspired jaundice-riddled color palette. Those yellow hues rest peacefully in the burial ground of cinema and they request not to be exhumed. There are two extremes with Pacino-DeNiro action movies. One is the aforementioned, critically-lauded Heat and the other is the unfathomably poor Righteous Kill. Den Of Thieves cherry-picks the plot from Heat and the 50 Cent from Righteous Kill and find itself in the sweet spot between these two movies on the quality spectrum. It may be one of the most curious moviegoing experiences you've ever had, but make no mistake, while it's antics are entertaining, it won't stay in your memory any longer than me typing the last word of this review. Be the first to comment on Den Of Thieves! Just use the simple form below. fullhyd.com has 700,000+ monthly visits. Tell Hyderabad what you feel about Den Of Thieves!